Running a green business means more than just recycling or cutting back on waste. For those in the dry cleaning industry, it might mean switching to more eco-friendly cleaning processes like wetcleaning, using safer solvents and detergents, using biodegradable packaging, or driving fuel-efficient delivery vans. These changes are really making a difference to the environment, and improving the safety of their customers and employees. 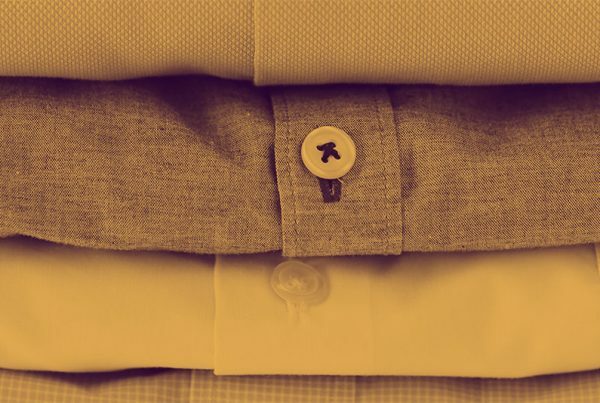 If you are a dry cleaner owner or manager, making green changes will obviously have a positive impact on the environment, but these changes can also have a major impact on your business and sales. Customers and employees prefer greener, safer products, and prefer to purchase services from green businesses, but unless they know about your commitment and all the hard work being put in, your efforts are bound to go unnoticed. That’s why marketing is so important, especially when it comes to using the storefront space to effectively communicate green business practices. When customers know and understand what is going on in the shop, they will be much more likely to return, share their experience with their friends and family, increasing word-of-mouth marketing and bringing more business into the store. Whether a business is just starting out on going green or has been focusing on sustainability for years, a green mission statement can create a target mindset for anyone involved in the business. This can not only make sure staff is on the same page when it comes to green priorities, but it can also ensure that customers know why bringing their business to a particular dry cleaner is playing a larger role in the green movement. Once a business creates a mission statement, an easy way to make sure everyone is aware of it is by displaying it in the storefront. This can be as simple as framing a print out of the statement and hanging it up to incorporating more elaborate designs. Regardless of the creative, making sure the mission statement is displayed in a prominent space can encourage customers to stop and take a minute to read about how their local dry cleaner is making real, green changes at their business. One of the first places many dry cleaners start when going green is revamping their cleaning process. Whether that means ditching perc and beginning to use more eco-friendly cleaning solvents or installing wetcleaning machines, customers should be able to easily understand how their clothing is being cleaned. Including some signage around the front of the store that explains the process used can spark discussions with customers and provide them with a deeper understanding of the important changes taking place. Signage can also include other green focus areas and facts that set the business apart. For example, if a dry cleaner is cutting back on water usage, making sure customers see a graphic of how many gallons have been saved in the last month or year can be an effective way to get the focus area across. Also, dry cleaners that update their name to have a green angle should always remember to update any logos and displays at the storefront to reflect the new, updated brand. Green packaging is a popular and effective way to take sustainability to the next level. Any dry cleaner that is investing in this area should be sure to showcase their packaging in the front of the store with signage that includes: why the switch was made, the material the packaging is made out of and information on how to recycle the packaging if applicable (for example, bringing it back into the store for secondary use). While not a true investment in a new packaging product, hanger recycling programs can also be beneficial. These can effectively be advertised with any incentives that will be offered for those who participate in the storefront area. Customers always have ideas for businesses, but sometimes all they need is an extra push to share them. One idea to encourage customers to share their ideas and options on eco-friendly topics is by installing a green comment box that lives at the checkout counter. 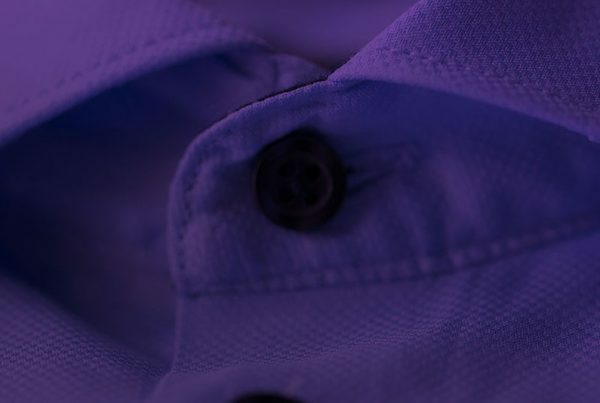 This can provide the business with new, green focus areas, as well as continue to build the conversation on why sustainability matters in the dry cleaning industry. If a business chooses to install a green comment box, it’s always important to report out on the ideas that are being implemented, and publicly thank specific customers who provide ideas that are placed into action. Green certification is like a stamp of approval for customers that are searching for sustainable businesses. For dry cleaners that are Green Business Bureau certified, being sure to capitalize on their green seal is a simple way to drive their eco-friendly message home. Making sure the seal is visible in the storefront should be of utmost importance. This includes on the front door or window, on delivery vans, as well as on any bags or packaging that is sent home with the customer. One example of this comes from GBB member, Duro Cleaners, based in Pittsburgh, PA. Duro Cleaners includes their GBB seal on each garment bag clothing is sent home in, ensuring customers understand their commitment to being a green place of business. For dry cleaners that haven’t taken the leap into green certification, GBB makes getting up and running easy and effective. More information on the benefits and how to join can be found by visiting greenbusinessbureau.com. Like with any investment a business makes, making sure people are aware of green changes and focus areas can ensure the message doesn’t get lost in a crowded marketplace. Capitalizing on space within the store can help to propel green messages forward, and provide a visual way for customers to become educated on business changes. To learn more about how going green can make a difference in the dry cleaning industry, check out this GBB Member Story on Ablitt’s Cleaners, a California-based dry cleaner that is leading the charge in running a sustainable dry cleaning business. 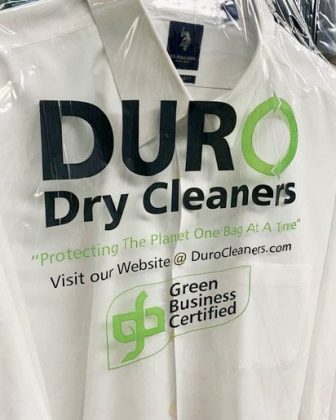 Duro Cleaners, a GBB Member in Pittsburgh, PA, has switched to biodegradable garment bag as an important part of their greener business efforts. As a GBB Member, Duro took the opportunity to have the bags printed with the GBB Seal to communicate home their commitment to sustainable business practices and reinforce their green brand. You can learn more about Duro Cleaner’s greening efforts in their GBB Member Story.